Well, what can I say? 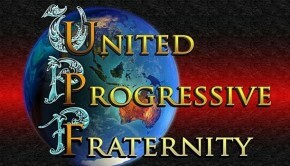 We’ve lived together for a couple of weeks and each day, with every format/device I have used to play United Progressive Fraternity (UPF) I have become more content – MP3, from the download, through the computer, headphones and a Bluetooth speaker, CD in the car and on my hi-fi. I knew nothing of this band, and maybe you don’t either, so a résumé. 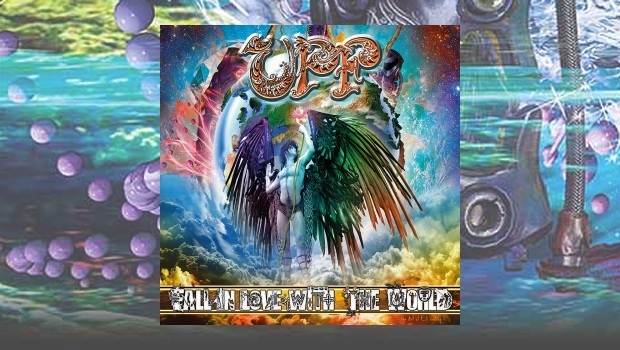 UPF formed from the ashes of Unitopia, an Australian band (nowt wrong wit that, poppet), a group of select, and well known progressive musicians and their guests: Mark Trueack – vocals, Matt Williams – guitar, Dave Hopgood – Drums and Tim Irrgang – percussion. This is the core of UPF, laying down the base sound that is enhanced by numerous guests, hence I suppose fraternity or brotherhood. Listening to the overall sound of the album, it is the guests that contribute to the final sound, with the possible exception of the pared down title track Fall in love with the World, a simple ballad whose message is all the better for not hiding behind layers of production. But maybe that is the point, here they are, and friends too. I think we will not find out until the live performances, work permits allowing, and perhaps a second album. The album opens with We Only Get One World (Overture), an interesting blend of world influences, and some Kashmir/Turkish musical stylings blended with western rock. The opening few bars very much remind me of Peter Gabriel’s Passion, from the soundtrack to The Last Temptation of Christ. The second track Choices is a combination of world influences; Eastern European and Arabic, a little Scandinavian metal, and Mark’s crystal-clear vocals, and is none the worse for that. It’s a nice entrance into an album, and it’s definitely radio friendly. These opening two songs are stronger on second hearing, and they are better viewed as a whole rather than two separate tracks. A rough comparison would be the long introduction on IQ’s The Road of Bones, where the introduction adds to the whole. Intersection is heavily Yes influenced, particularly in the jazz-rock style of the bridge. The lighter end of the rock world seems to be the form of this track and without the bridge it would easily fit into an AOR radio show. A lot of attention has been paid to the writing and the melody is strong. It could be easily dismissed as pop on early listens, but it grows on you, especially if heard loud and clear. I would say there are bits of Jethro Tull and Supertramp in Water, but with more of a jazz edge. Add to that a smidgeon of Yes, a little Foreigner, and other bands from my youth (the eighties…I say youth but 20’s), but it doesn’t sound dated. The message is clear in the lyrics, and it is a strong and valid one. Jon Anderson sings backing vocals on this, and unlike the previous track it is not a Yes simulacrum. It’s a good pop tune rather than prog, whatever that may be, even with the bridge passage. You might think this sounds disparaging, but it isn’t. Prog to my mind is a combination of musical influences, this track just compacts it into a relatively short form. I could happily sing along to this, disturbing anyone unfortunate to be in earshot. Don’t Look Back – Turn Left is a jazzy, danceable, love sax (not a typo), family friendly tune. It’s a good song, using the interaction of spoken passages and it drives along quite nicely. If I am being honest though, it is also the track that I am most likely to skip. I cannot quite put my finger on why, but I think it is one to decide for yourself. Travelling Man has guitarist Steve Hackett in the mix somewhere. Now this is prog and again there are multiple world music influences. Yes, you can dance to prog, I would, possibly in a room with the lights out, but dance all the same. I think I would buy the album for this track alone – it’s not Supper’s Ready, but it’s an enjoyable ride. I don’t know how much input Hackett had, but I would say definitely some. The eastern European influences are again strong in this track, with Turkish and Magyar gypsy fiddle playing offset against some driving lead guitar and bass rhythms, interweaved with some quieter acoustic guitar passages. These I perceive to be the Hackett’s inputs, and some of the passages do indeed sound like tracks of Steve’s. This track is 20 minutes long! It doesn’t feel like it, I have had this track on repeat, and happily let it run a couple of times on an hour long journey. For me, this is the strongest, most progressive track on the album. There are bold elements and subtle contrasts. Take the time to listen and I do not believe you will be disappointed. Fall in the Love with the World is a simple love ballad to the world and us, and its pared-down simplicity works for me; voice, guitar and mandolin. I love the thought that we could stop fighting and learn to cherish our differences… It’s a good tune bridging between Travelling Man and Religion of War. The unknown mandolin player gives an excellent performance. I have revisited this several times since my first listen and I enjoy it more each time. Religion of War – great track, interesting lyrics, but maybe that’s because it fits with my philosophical outlook. The guitar and bass drive the song along, and it is straight rock/pop, but none the worse for that. This one seems at odds with what has gone before, but it is a strong track, as it is a contrast to the earlier songs, but good though it is, it doesn’t quite seem to fit the overall feel. I have given this album a lot of listens, and with more volume the bass shines through. The prog element? It’s there, but there is more AOR than prog, it’s quite mainstream. Back on the long track, yes, this is good, clever, and on second listen I am hearing the words. 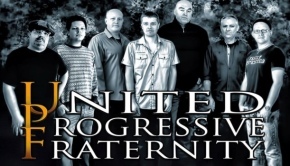 This album is a showcase for the talents of United Progressive Fraternity, it is a good showcase, the use of the guests are what makes it immensely listenable, I think I will look forward to the second album, but I do wonder if a more defined direction will appear? Mark’s voice is incredible, a strong and clear, and I suspect it would be equally at home in a musical as with this material. His range and clarity make it a pleasure to listen to. Matt demonstrates the versatility you would expect from a prog guitarist, with Tim and Dave providing a solid rhythm section. There is so much to like here, but as said I await the second album. Production is excellent, especially in the purity of the separation in the instruments – it’s almost like listening to a good orchestra and the album really benefits from good stereo separation, the tracks becoming more involved and stronger on repeated listens. I like it, it will it go round and round in the car, very possibly. CDs that gravitate to the car tend to stay there until the half annual clean. If you like any of the bands I’ve mentioned, then I think you’ll find something to enjoy. And me? Well, I am going to explore the Unitopia catalogue, if for nothing else, to see where this band have come from, and perhaps gain some clues as to where they might be heading. My conclusion? UPF is VFM (Value for Money).